Version 3 - New textures by Tom Sawyer! All buildings come in 3 different styles! Press the f-key to change while placing the building. written as non-edible vegetables so people don't drink them. A Trader, taken from Rowhouse mod, with new textures. He sells everything but buys only vegetables and alcohol. The Tequila Bar serves Tequila from Barrels. You need it if you want to drink the Tequila. and non-edible (Agave, Pulp and Barrels). Some Billboard Signs to tell the world. This version IS NOT save-game compatible with version 2. 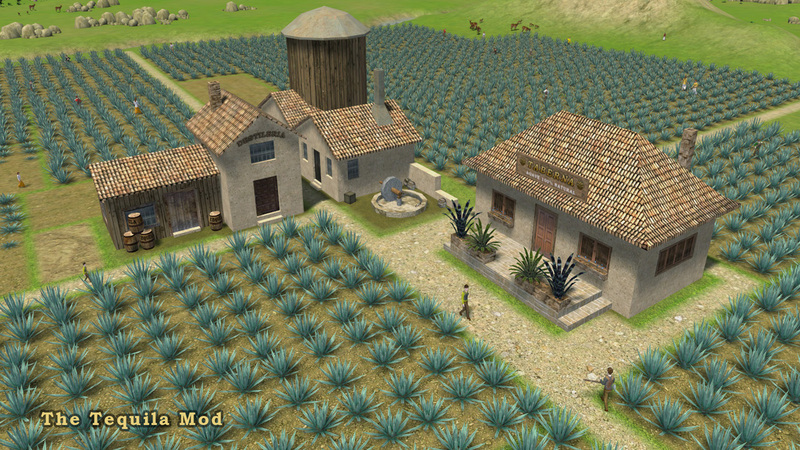 If you have an old version of The Tequila Mod, remove that first! If in doubt, start a new game. You can't store/trade Agave, Pulp or Barrels in vanilla game. I think CC and NMT already have storage.